I know I said that I wouldn't post any more Mali pix, but this is really the last one. She is wearing the cutest outfit ever, but that's not the point. She is driving past a Seatttle storefront that residents of that town may or may not be able to identify. Not the point either. The point is her riding in a big girl car seat. 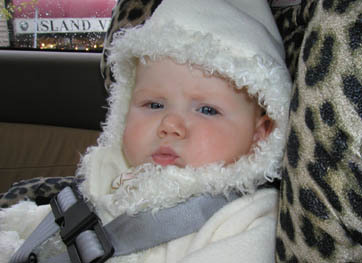 Leelo's car seat, to be specific (it can be positioned to face backwards). And the reason she's in it is part of a very long story, which I will relate later on when I have the time and hands to do so.